A new home in Chicago is touting itself is a model for green homes in the area and boasts graywater recycling, rainwater collection, solar passive design and an impressive solar system. 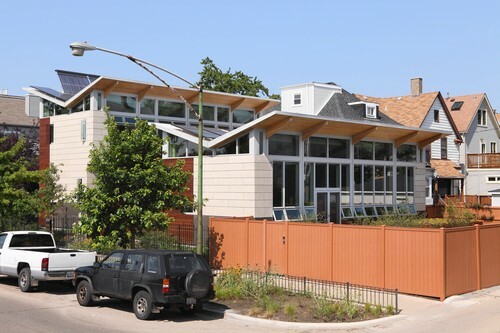 The beautiful residence in the Ravenwood area is slated to be the first LEED Platinum home in Chicago, and it’s no surprise really considering the home is also net zero. Read on for more details about this stunning home and all the green design elements that are included. Michael Yannell, a pharmacist at Rush University Medical Center, is the owner of the net zero home and also a zealous supporter of green building. He commissioned the house because he wanted to show that homes could have a much smaller environmental impact and still be beautiful. Yannell said, “I wanted to make a big, splashy statement to the city that that was the wrong direction.” Designed by local green building experts, Farr Associates, the 2,675 square foot house does serve as a great example to the city for what is possible. The 4 bedroom, solar passive home is split into two south-facing wings connected by a foyer. The northern wing contains the bedrooms, office and music room, while the south wing, which is about 10 feet shorter than the north wing, contains the kitchen, dining room and living room. Large, triple paned windows on the south sides let natural light flood into rooms, and since the south wing is shorter, light can easily access the north wing across the short courtyard. Butterfly roofs on each wing slope to the center and act as the catchment system for rainwater. Up on top of both north facing roofs are 48 solar panels, which are cleverly hidden from view at street level. The roof’s pitch was optimized for the best solar angle to maximize solar energy production from the 10 kW system, which is expected to reach 18,000 kWh per year. So far Yanell hasn’t had to pay for any energy yet as he has been feeding all of his excess energy onto the grid. The house has only been there since April though, so he expects that during the winter, when it isn’t as sunny, he’ll have to take some power from the grid. He still expects to over the year to produce more than he uses. There are also 4 evacuated tube collectors for a solar thermal hot water system on top of the roof. Besides the photovoltaic and solar thermal systems, the home’s heating and cooling is maintained by a geothermal heat pump. There are 4 wells dug 250 feet deep into the property in order to use the constant temperature of the earth to reduce energy use for heating and cooling. The exterior of the home is clad in warm cedar panels and cool and fiber-cement board panels, which act as a rainscreen to shield the home from the elements. In between the exterior and the inner insulation is a small gap that helps the home shed moisture. A green roof placed above an underground garage help reduce heat gain as well as reduce stormwater runoff. Outdoors the grounds are landscaped with native and low maintenance plants. Indoors, the home is finished with sustainable and renewable materials like recycled paper countertops. The rooms are light filled and airy, with lots of operable windows allowing for natural cross ventilation. Water from the washing machine is used to flush the toilets in what is considered to be the only graywater recycling system in the city. And finally the house is conveniently located adjacent to Chicago’s Metra Ravenswood train stop in addition to several city CTA hubs.